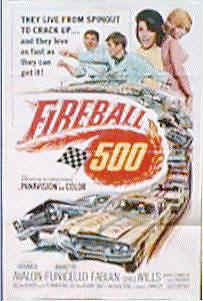 Though it has been a while since I have seen the movie this car was in (called 'Fireball 500'), I recall it being a typical 60's movie about car racing. Most of the action was with the babes (did we actually dress that way? ), and there was the obligatory musical number. This car was featured in the movie, but only for just a few scenes of it. Typical of flicks in 1966, the premise of the movie was rather stupid. Kind of a Cannonball Run meets Beach Blanket Bingo sort of thing. Here is some info on the movie: Cast: Frankie Avalon, Fabian, Chill Wills, Annette Funicello (man, did I think she was a babe!) Running Time:1 hr 32 mins Summary: A promoter hires a stock-car driver for a cross-country race that turns out to be a bootlegging run. Like I said. Dumb. 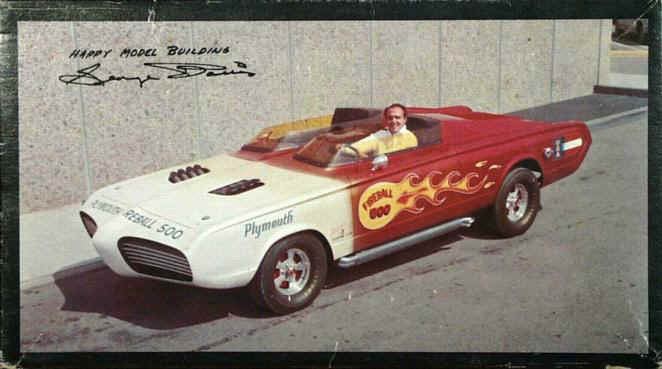 Needless to say, it allowed people like George Barris to produce some rather neat cars. 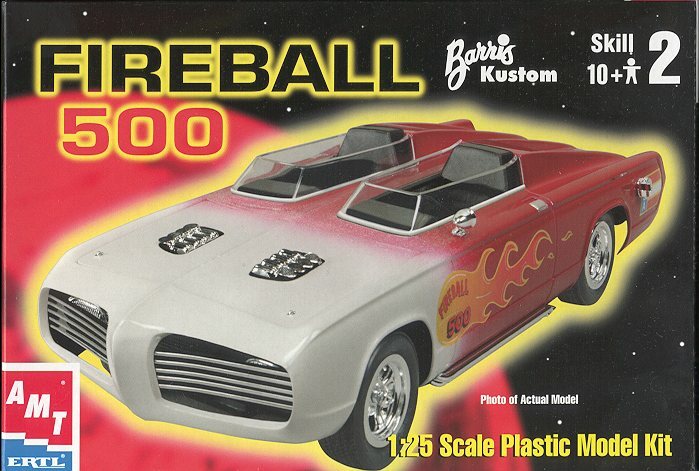 This particular one started life as a '65 Barracuda, and you can still see some of the original car in this one. AMT has been doing us all huge favors by reissuing a bunch of neat cars from the late 1960s/early 70s. This is when custom cars, excuse me, Kustom Kars, were king and it seems like any movie that had anything to do with cars had a special built for it. Most of these are old MPC kits as Ertl bought MPC so has all the old molds. However, this kit was initially released by AMT. Frankly, this kit looks very clean and crisp for such an old kit. Obviously the molds were in good shape or well cleaned up. Rather than drag out all the parts to show you, here is a scan of the body of the car. AMT has recently been boxing their kits with the body in its own bag to keep it from getting scratched up. Good idea. The chrome bits are in their own bag as are the clear ones. The red parts are just tossed in the box along with the axles and tires. The rest of the parts are in one bag and held together with a rubber band to keep them from moving too much. The tires are hollow Goodyears and well detailed. 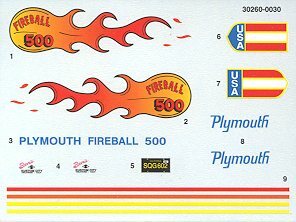 Not sure what the real Fireball 500 wore, but I bet it was Firestones! The chrome parts look just great and are nice a shiny. There are 6 building steps and all the parts are named. Any bits that need painted are also called out in the instructions. This kit comes with a trailer for the car, which is a nice surprise as there is no mention of it on the box. The tires for it are styrene, and not the same quality as those for the car itself. There is a decal sheet for the logos and flames on the side of the car. If you take a look at the picture of the real car at the top of the page, you will notice that there are some real differences with the flames on the side. Good luck trying to fix it!! Not being a modern kit, there really are not that many parts. The engine itself is only 17 parts. There is no separate front or rear suspension, all of that being molded in the lower frame. In fact, just about all the car is rather minimalist, despite not being a curbside. However, it is a 30 plus year old model and cannot be measured by today's standards. I for one am really psyched about this and the other current releases. I'm also happy that this one comes in a real box! !